A field of 1,763-entrants has been diminished to just one man in Event #58: $1,500 No-Limit Hold'em. The last player standing is Artur Rudziankov, playing under the Czech flag and only the second player ever representing that country to win a WSOP gold bracelet. An extra fourth day of play was needed with the two last survivors coming back to play it out on the Main Stage. The cameras weren't filming, but the atmosphere wasn't any different because of it. Both the Czech rail as well as the Spanish rail for Mario Prats were big and loud. In the end, though, it was the Czech flag that was waved the longest. After some heavy battles on Day 3, the field of 26 remaining players was eventually whittled down to just 10. 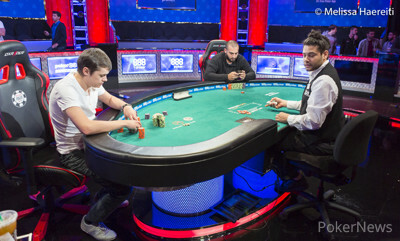 The unofficial final table was formed but, still, one player had to go home without the note of making the official final table. Scott Lychwick and Mario Prats scored early double-ups before two-time WSOP bracelet winner John “Razor” Phan bubbled the official final table. Phan moved all in from the button with pocket sevens only to see Christian Rudolph in the big blind call instantly and turn over pocket kings. The board ran out ace-high and that was it for Phan. Only five hands into the official final table, Lee Watkinson raised for the vast majority of his stack from the small blind. Fellow short stack Scott Lychwick called all in for slightly less. Lychwick showed six-four of diamonds and Watkinson had five-three of diamonds. The flop brought a five and a three and Lychwick failed to improve to a straight. Once the final eight came back from dinner, it took almost two hours for the next player to fall. It was the always-talkative Martin Kabrhel who ran out of chips. Kabrhel, accompanied by his chip-protecting hippo, was entertaining the rail and opponents for the entire day, though some of them were willing to call the clock on the Czech at any point. Kabrhel was eventually down to fewer than four big blinds and raised for most of his stack with ace-three. Arman Zolnoorian and John Esposito called out of the blinds and the latter spiked a king with king-nine to send Kabrhel to the rail. Esposito was the next to fall. The 1999 WSOP bracelet winner shoved from the small blind and tabled king-five suited. Rudolph flipped over ace-queen suited in the big blind and the board ran out queen-high. Former WSOP bracelet winner Lee Watkinson had to settle for sixth place. He defended his big blind and shoved on a ten-high flop with nine-six for a gutshot only for Rudziankov to snap-call with ace-ten for trip tens. Both the turn and river bricked, ensuring a first-time bracelet winner would be crowned in this tournament. Rudolph suffered a massive setback when he called the shove of Prats. Rudolph had pocket tens while Prats only had pocket fives. Prats, however, flopped and rivered a five for a set and then quads to leave the German with just change. Rudolph doubled once but soon after ran ace-king into the pocket aces of Rudziankov to go out in fifth place. In hand #144, a short-stacked Arman Zolnoorian moved all in with ten-nine off suit from the small blind and Rudziankov called with king-six in the big blind. Neither player connected with the ace-high board and the field was reduced to the last three hopefuls. Only nine hands later, Timothy Miles got his last 14 big blinds in from the button holding king-ten. Rudziankov quickly called with ace-king in the big blind and the kicker played a crucial role on a king-high board to set the stage for the heads-up battle. Prats almost closed the gap, only to fall back when Rudziankov showed him a bluff in the last hand of the night. With the momentum on Rudziankov's side, Prats instantly opted to come back the next day instead of playing it out when the organizers asked what the players wanted. At 1 p.m. local time, the two returned to the Brasilia Room in the Rio All Suite Hotel & Casino. While Prats started out the shorter stack, the roles were reversed soon enough as the Spaniard doubled when he made a big call with bottom pair on a dangerous board. Rudziankov showed a bluff and Prats suddenly had the advantage. The Spaniard didn't enjoy the lead for long as Rudziankov retook the lead soon enough, winning several medium-sized pots. Rudziankov won more and more chips but saw Prats double once again when his flush draw didn't improve in time to Prats two pair. Prats made a full house on the turn, securing the double-up and rendering Rudziankov's rivered flush useless. A huge failed bluff by Prats changed it all around again. Rudziankov made the nuts on the river and saw his Spanish opponent shove all in on him with nothing but eight-high. Rudziankov had the majority of the chips after that hand, as Prats had just three big blinds left. Two hands later, it was all over. Prats got it in with the best hand, ace-jack, but Rudziankov out-flopped him, hitting a four with jack-four. And just like that, it was all over. Rudziankov, while born in Belarus, was crowned the second Czech bracelet winner for the WSOP stats, living there for 19 years now. Rudziankov is actually friends with Tomas Junek, the player who won the first bracelet for the Czech Republic back in 2012. "He's not going to be very happy," Rudziankov smiled after he was handed the bracelet for the photos. "I was just running hot. You've got to run hot to win these tourneys. There's nothing to it. You just have to get lucky," Rudziankov said. "They just have to fold when you don't have it and call when you have it. That's it." Asked about whether he was happy with the extra day or not, Rudziankov told PokerNews he would've rather played it out on Day 3; "After that big bluff, I had the momentum. He snap-said he wanted to finish tomorrow because he felt I had all the momentum." Still, Rudziankov more than understood Prats' decision to call it a day. "Two years ago, the same happened with me. That time, I felt like I didn't have the momentum so that's why I said I wanted to finish the next day. Just to regroup and talk strategy with my friends." 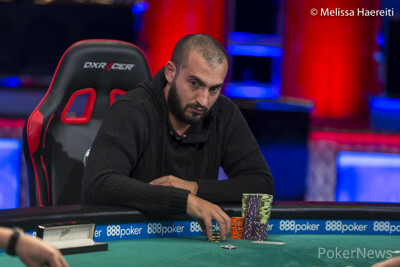 Two years ago, Rudziankov finished runner-up to Ivan Luca in a $1,000 event, good for $219,976. He had to settle for silver that time; this time it was gold. Where some players end up a bit tired of poker after a long summer at the WSOP, the contrary is true for Rudziankov. "Vegas always saves me. When I'm about to bust, Vegas saves me." Rudziankov, who was joined by a big group of Czech players cheering him on on the final day, thanked his coach Sam Grafton and backer Vojtěch Růžička as he received the bracelet. The group seemed destined to celebrate somewhere in Vegas. Other than a big party, however, not much was going to change, according to Rudziankov. "The Main Event I play every year, obviously. Not many changes. Not really, just more money for poker I guess." 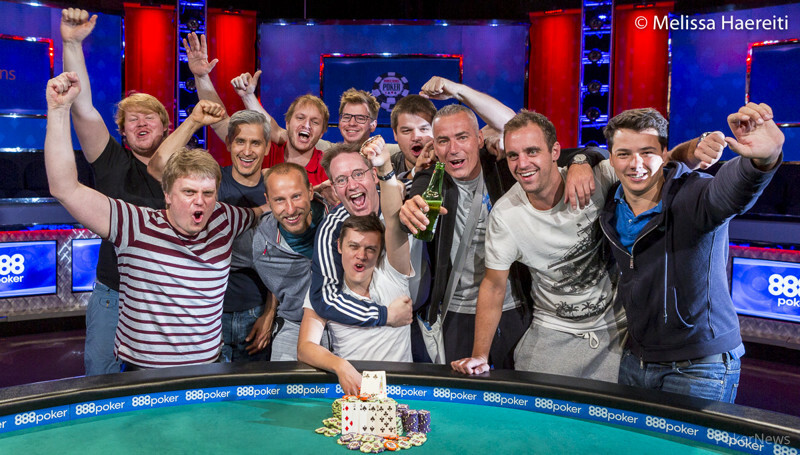 Hand #200: Artur Rudziankov shoved all in from the button and Mario Prats called instantly. The rail, who couldn't really see what the hands were, asked what was going on. Rudziankov, in Czech, sounded annoyed as he shouted that it was jack-four against ace-jack. Prats started out the favorite, but that all changed after the flop came . The on the turn and on the river didn't save Prats, and he had to settle for second place, good for $244,611. 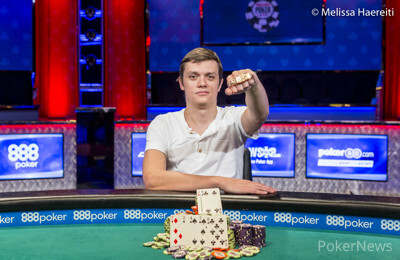 Hand #192: Artur Rudziankov raised to 400,000 and Mario Prats three-bet to 1,100,000. Rudziankov folded. Hand #193: Prats raised to 400,000 and Rudziankov called. The flop came and Rudziankov checked. Prats bet 600,000 and Rudzianokov folded. Hand #194: Rudziankov raised to 350,000 and Prats called. The flop was and Prats checked. Rudziankov bet 240,000 and Prats folded. Hand #195: Prats raised to 400,000 and Rudziankov called. The flop came and both players checked. They both checked the turn and river, and Prats won the hand with ace-high. Hand #196: Rudziankov raised to 350,000 and Prats called. The flop was and both players checked. The turn was the and both players checked again. The river was the and Prats checked. Rudziankov bet 1,100,000 and Prats folded. Hand #197: Prats raised to 400,000 and Rudziankov folded. Hand #198: Rudziankov raised to 350,000 and Prats three-bet to 1,100,000. Rudziankov called. The flop came and Prats bet 675,000. Rudzianokov called. The turn was the and both players checked. The river was the and Prats shoved all in for his remaining 5,065,000 and Rudziankov snap-called, showing for the nuts, a Broadway straight. Prats looked deflated and showed . Hand #199: Mario Prats shoved all in from the button and Artur Rudziankov was quick to call. The board ran out an uneventful and Prats doubled up. Hand #187: Mario Prats opened for 325,000 and Artur Rudziankov called. The flop came and Rudziankov checked. Prats bet 300,000 with a total stack of 2,745,000 and Rudziankov shoved all in. Prats called just about instantly. It was a flush draw up against the made hand, and it was all sealed on the turn. Prats raised his arms and celebrated his double-up with his friends on the rail. Rudziankov started counting out what he owed while the dealer finished the board with the , giving Rudziankov a useless flush. Hand #188: Rudziankov opened for 400,000 and Prats called. Prats check-called a bet of 300,000 on but check-folded to Rudziankov's 1,040,000 second barrel on the turn. Hand #189: Prats opened for 400,000 and Rudziankov called. Both checked the flop and turn before the completed the board. Rudziankov check-folded to a 500,000 bet by Prats. Hand #190: Rudziankov gave Prats a walk. Hand #191: Prats opened for 400,000 and Rudziankov folded. Hand #180: Artur Rudziankov folded and Mario Prats got a walk. Hand #181: Prats raised to 350,000 and Rudziankov called. The flop came and Rudziankov check-called Prats' 350,000 bet. The turn was the and Rudziankov check-called another bet from Prats, this time for 1,100,000. The river was the and both players checked. Rudziankov showed and won the hand against the that Prats offered. Hand #182: Rudziankov raised to 350,000 and Prats called. The flop came and both players checked. They both checked the on the turn as well, then Prats led for 700,000 when the hit the river. Rudziankov folded. Hand #183: Prats folded and Rudziankov got a walk. Hand #184: Rudziankov raised to 335,000 and Prats called. The flop came and both players checked. The turn was the and Prats checked. Rudziankov bet 850,000 and Prats folded. Hand #185: Prats raised to 325,000 and Rudziankov folded. Hand #186: Rudziankov raised to 350,000 and Prats called. The flop came and both players checked. The turn was the and Prats check-called a bet of 850,000 from Rudziankov. The river was the and Prats checked. Rudziankov bet 2,000,000 while Prats only had a little over 3 million behind. He folded and Rudziankov won the pot. Hand #174: Artur Rudziankov opened the button for 300,000 and Mario Prats called from the big blind. Prats check-called a bet of 400,000 after the flop and another 900,000 on the turn. Both checked the on the river and Prats announced having two pair. He showed and Rudziankov mucked angrily. Hand #175: Prats opened for 250,000 but folded to Rudziankov's 850,000 three-bet. Hand #176: Rudziankov opened the button for 300,000 and Prats folded. Hand #177: Prats raised to 250,000 and Rudziankov called. Rudziankov check-called a bet of 200,000 on the flop before both checked the on the turn. The river saw Rudziankov bet a hefty 1.4 million. Prats folded and Rudziankov showed the , tossing it right in front of Prats' stack. Hand #178: Rudziankov raised to 250,000 and Prats called. The two of them checked the flop of before Prats bet 375,000 on the turn. Rudziankov called and called Prats' 875,000 bet on the river as well. Prats announced he had a king and Rudziankov tabled for the straight. Rudziankov still wanted to see Prats' hand, and the Spaniard obliged, showing . Hand #179: Prats opened the button for 300,000 and Rudziankov called. Rudziankov checked on and called the 300,000 bet that followed. The on the turn saw Rudziankov check again. Prats bet an even 1 million and Rudziankov called. He only put in 900,000 though, a mistake that was corrected by the dealer. "Come on, you've done this four times now," Prats said. "Sorry, chips have bad colors," Rudziankov replied. "What are you angry about?" Rudziankov asked, to which Prats did not reply. The river saw both players check and Rudziankov took it down with . Hand #173: Mario Prats raised to 240,000 and Artur Rudziankov called. The flop came and Rudziankov checked. Prats bet 200,000 and Rudziankov raised to 760,000. Prats called. The turn was the and Rudziankov led for 840,000. It didn't take too long for Prats to call. The river was the and Rudziankov went all in, putting Prats at risk should he call. Prats took a few moments and eventually called by tossing in one chip. Prats turned over for a pair and Rudziankov showed . Prats is now the chip leader. Hands #168-172: The First All In! Hand #168: Artur Rudziankov opened the button for 300,000 and Mario Prats called from the big blind. Both players checked the flop and turn before the completed the board. Prats bet out 175,000 and Rudziankov called just about instantly. Rudziankov confirmed he did have a ten, and eventually showed his as Prats seemed hesitant to show. Prats slid his cards forward face down but showed upon request by Rudziankov. Hand #169: Prats opened the button for 250,000 and Rudziankov three-bet to 850,000. Prats shoved and Rudziankov folded instantly. Hand #170: Rudziankov opened the button for 300,000 and Prats called. Both checked the flop of and Prats checked again on the turn. Rudziankov bet 500,000 and Prats folded. Hand #171: Prats gave Rudziankov a walk. Hand #172: Rudziankov opened for 300,000 and Prats folded. Two Remain, Who Takes Home the Bracelet?